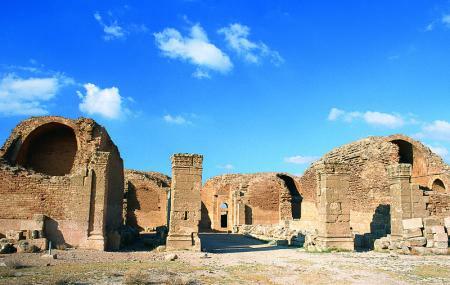 Around thirty kilometers south of Amman are the ruins of an old Umayyad winter palace. Located inside a square enclosure and outer wall of 25 towers is a central courtyard, a reception hall wing, several symmetrically arranged rooms, a small mosque facing Mecca, an even smaller courtyard, a basilica shape hall, and several side rooms in the reception hall wings. But the most striking element of this ruin is probably the carved frieze on the southern facade. The frieze is known for its fusion of Classical and Sassanian elements, which was the precursor to Islamic art. However most of that decorated part of the facade has been moved to the Pergamon museum in Berlin. How popular is Qasr Al-mshatta? People normally club together Habibah Sweets and Rujm Al Malfouf while planning their visit to Qasr Al-mshatta. Not a bad little side trip to see some castle ruins, but the road there is filled with speed bumps and slow moving trucks. The area around the site is sort of industrial. I probably would have skipped it to get to my next destination sooner. Not easy to find without GPS because it's located in the industrial Zone of the airport. Nice to stop by as you leave or go to airport. No facilities (for tickets or wc). Nice stop to wander around for little. Lots of trash - unfortunately a common problem. Hardly anyone here. Google directions can get you here ok.